From the Publisher: In a fairly succinct treatment, FUNDAMENTAL PERSPECTIVES ON INTERNATIONAL LAW provides a unique mix of cases, articles, documents, text, charts, tables, and questions. The key concepts of international law are introduced through thoroughly up-to-date content. Important cases are continually updated on the author’s website. The text is complemented by numerous review problems. From the Publisher: Violations of international law and human rights laws are the plague of the twentieth and twenty-first centuries. People’s inhumanity to people escalates as wars proliferate and respect for human rights and the laws of war diminish. In Decoding International Law: Semiotics and the Humanities , Professor Susan Tiefenbrun analyzes international law as represented artfully in the humanities. Mass violence and flagrant violations of human rights have a dramatic effect that naturally appeals to writers, film makers, artists, philosophers, historians, and legal scholars who represent these horrors indirectly through various media and in coded language. This reader-friendly book enables us to comprehend and decode international law and human rights laws by interpreting meanings concealed in great works of art, literature, film and the humanities. Here, the author adopts an interdisciplinary method of interpretation based on the science of signs, linguistics, stylistics, and an in-depth analysis of the work’s cultural context. This book unravels the complexities of such controversial issues as terrorism, civil disobedience, women’s and children’s human rights, and the piracy of intellectual property. It provides in-depth analyses of diverse literary works: Joseph Conrad’s The Secret Agent and the movie Hotel Rwanda (both representing terrorism); Martin Luther King’s Letter from Birmingham Jail ; two documentary films about women and family law in Iran, Divorce Iranian Style and Two Women ; Lisa See’s Snow Flower and the Secret Fan (women’s human rights and human trafficking in China); Uzodinma Iweala’s Beasts of No Nation (shedding light on child soldiering and trafficking in Africa), and much more. From the Publisher: Offering a more accessible alternative to casebooks and historical commentaries, Law Among Nations explains issues of international law by tracing the field’s development and stressing key principles and processes. This comprehensive text eliminates the need for multiple books by combining discussions of theory and state practice with excerpts from landmark cases. Renowned for its rigorous approach and clear explanations, Law Among Nations remains the gold standard for undergraduate introductions to international law. From the Publisher: Due to the increasingly global nature of contemporary politics, it is necessary for students to have a solid grasp of international law. International Law for International Relations provides comprehensive coverage of the different ways to approach the study of international law. Drawing upon the work of internationally renowned academics and practitioners, this cutting-edge anthology identifies key issues within the field. Marked by its lucid presentation of the complexities of international law, this reader is ideal for students who have not who have not previously studied law. It is also suitable for graduate students who are tackling international law for the first time. From the Publisher: Fault Lines of International Legitimacy addresses the following questions: What are the features and functions of legitimacy in the international realm? How does international legitimacy – as exemplified in particular by multilateral norms, organizations, and policies – change over time? What role does the international distribution of power and its evolution have in the establishment and transformation of legitimacy paradigms? To what extent do democratic values account for the growing importance of legitimacy and the increasing difficulty of achieving it at the international and national levels? One of the central messages of the book is that although the search for international legitimacy is an elusive endeavor, there is no alternative to it if we want to respond to the intertwined demands of justice and security and make them an integral and strategic part of international relations. From the Publisher: This work aims to fill a gap in the existing legal literature by presenting a compact, concise but nevertheless panoramic view of the law of the United Nations. Today the organization is at the centre of all multilateral international relations and impossible to avoid. And of course the UN Charter is a foundational document without which modern international law cannot be properly understood. In spite of its importance, this pre-eminent world political organization is poorly understood by the general public, and the extent and variety of its activities is not widely appreciated. Even lawyers generally possess insufficient knowledge of the way its legal institutions operate. Assessments of the organization and judgments about its achievements are consequently frequently distorted. This work is aimed especially at remedying these deficiencies in public and legal understanding, but also at presenting the organization as a coherent system of values and integrated action. 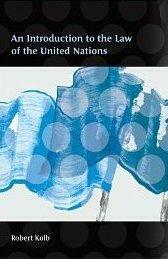 Thus the book presents an overarching view of the significance of the UN organization in general, the history of its origins in the League of Nations, the aims and principles of the Charter, governmental agencies, members of the Organization, the non-use of violence and collective security, the peaceful settlement of disputes, and the question of amendments to the Charter. This work will be suitable for students of law and international relations, as well as scholars and those interested in the work and organization of the United Nations.